This the best moisturizer for dry skin and Acne prone skin. 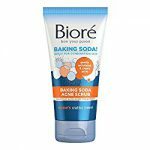 I always recommend this product for Red and Dry skin due to any Acne or scar treatment. This product is designed, so it does not leave your skin oily or shiny. It also has a SPF 30, so I always recommend to put it on after your Acne treatment and/or a scar treatment like Derma/Needle rolling. This product also does not leave those white marks that some other moisturizers do. It is easy to apply, fragrance free and because it is meant for acne prone skin it will not clog your pores. A lot of Acne products that contain Benzoyl Peroxide or Salicylic Acid will most likely dry your skin, creating redness, swelling and peeling that not only could clog your pores, but it also just looks bad on the skin. Moisturizing is very important since it will keep your skin hydrated and looking smooth and healthy, it is a great ally to hiding all the treatments you might be using. A dry, red peeling skin just doesn’t look good and the last thing you want or your skin is extreme dryness, you already might have Acne or Scars to worry about, why worry about the thing that is the easiest to resolve? Cetaphil has wonderful products and this is by far the best moisturizer for Acne prone skin. It can also be use to hydrate and sooth the skin after Derma rolling. The amount of positive reviews speak for themselves and the product was designed for people with Acne prone skin, so basically people with oily skin. This stuff just works and it should be one of the products you should always have at home. The SPF 30 protection makes it a great ally to just apply every day to your skin rather than deciding between a moisturizer or sunscreen and then hoping neither will clog your pores, putting this bad boy on will take care of all the problems without causing any side effects. Always, If you are using it as a every day moisturizer make sure you apply it only after your Acne treatment is fully dried on your skin. When applying the moisturizer do so the same way as applying your Acne treatment, in circular motion all over your face until the moisturizer completely dissipates in your skin. If you are using it for after Derma rolling, add a little extra to keep your skin hydrated and protected over night. Click on Dermacontrol Moisturizer to learn more over at Amazon, this product is your best tool for dry and red skin, if you’ve tried any of the products recommended in the Acne and Scars pages or simply for protection from the Sun and keeping your skin healthy and looking great this is a wonderful product to use. This product not only can protect you from harmful Sun rays, but it will also keep your skin hydrated, smooth and most importantly without creating any risk of clogging your pores or affecting any of the Acne treatments you might be using. Don’t hesitate to comment or ask any questions and I’m certain this will help you of your path to Beautiful Clear Skin. Actually got this for my daughter since her acne cream is really drying her skin, very nice product it doesn’t feel slimy or leave a white mark and best of all it doesn’t seem to affect her skin or acne cream, thanks for another great recommendation. Great to hear! This product is perfect for Acne prone skin and greasy skin, so there should be no negative effects. The SPF protection is a great bonus too, she should use it and so should you, this is the best moisturizer I’ve found for acne and/or scar healing skin. Thanks for reading.